Boost compact pistol firepower with Gold Dot Short Barrel. Speer's Gold Dot Short Barrel ammo generates better velocities out of compact guns, and the bullets are adjusted for caliber and weight for maximum performance. 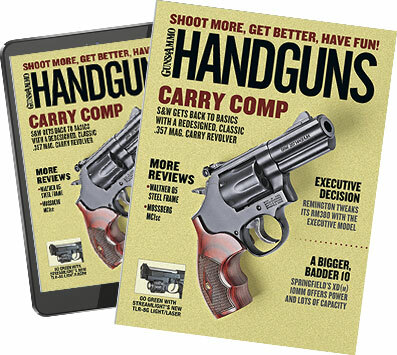 Anyone who has carried a handgun for any length of time realizes that compactness and light weight are valuable assets. However, both come with a price. The lighter a handgun is, the more recoil hammers you, although practice can overcome that initial disadvantage. The more compact the gun is, however, the shorter the barrel, which means you've lost potential velocity. No amount of practice will get that velocity back. Lost velocity usually means decreased expansion, less penetration or both. Enter Speer's Gold Dot Short Barrel loads. The idea is to blend powders and boost performance in short barrels without making the load unsuitable for standard-length barrels. The end goal is to meet or exceed the standards laid down by the FBI ballistic gel protocols. The load I tested is the .40 S&W 180-grain Short Barrel. The original idea for the .40 was to produce as close to .45 ACP performance in a 9mm-size handgun as possible. That means a 180-grain bullet, as even-heavier bullets fall off the edge of the .40 S&W case's performance envelope. However, the 180 is, in my opinion, too heavy a bullet for optimal performance in the .40, which makes it a perfect test for the Short Barrel concept. The Gold Dot bullets are formed by plating a core, then swaging, punching, stabbing and caressing the plated lump until it is a precisely shaped projectile. Then Speer uses low-flash powders in nickel-plated cases to ensure you have the least-flash, most-reliable ammunition possible. Speer lists it as going 950 fps out of a 31â„2-inch barrel, which is certainly enthusiastic, and given the variations of barrels themselves, spot-on. Out of the 41â„4-inch barrel of my Yost High Power, the Short Barrel load generated 1,013 fps. Not bad, considering that many other 180-grain factory loads top out in the mid 900s or less in that particular pistol. Out of a four-inch Glock 23, the Short Barrel load produced 949 fps, and from a three-inch barreled Springfield EMP I got 907 fps. It's not the 950 fps Speer promises for a 31â„2-inch gun, but 900 fps out of a compact pistol like the EMP is cracking good performance and nothing to sneer at. By comparison, the standard Speer Gold Dot load for a 180-grain bullet is listed as 1,025 out of a four-inch barrel. The accuracy of the pistols tested with this load reflects more their compact size than any supposed shortcomings of the Gold Dot load. Shooting something as compact as an EMP for accuracy testing is not a relaxing plinking session. It's work. That I was able to shoot groups that subtended less than the apparent width of the front sight, while managing the recoil of defensive-level loads in .40 S&W, is a good sign. The FBI protocols insist on a penetration depth of not less than one foot. Twelve inches. This despite going through incidental barriers such as light and heavy clothing. Once a load proves it penetrates to the minimum, then the projectiles are measured for expansion and retained weight. One thing you can count on from Gold Dot bullets is that they will expand and retain weight. The special bonding process of jacket to core means no core separation, and the soft alloy of the core ensures expansion. Fired through heavy clothing, this Gold Dot still managed 13 inches of gelatin penetration. Speer goes to the trouble of adjusting the design of each caliber and weight Gold Dot bullet for the particular use it will be loaded to, including the Short Barrel loads. So you do not see the same bullet getting stuffed in all 9mm and .38 Special loads, nor the same bullet in .40 and 10mm loads. Speer makes tuned bullets for consistent performance in different applications. And so we had no surprises here. The bullets expanded in a fashion both exemplary and boring. Time and again, I'd see 13 to 14 inches of ballistic gel perforated by a fully expanded bullet. The expansion was always in the .600- to .650-inch range, with petals folded back. I have never seen a Gold Dot bullet shed a petal unless it has had to rudely force its way through sheet metal in order to fulfill its ballistic gel destiny. And I've seen that only a couple of times. Speer has managed to get a lot of velocity into a bullet that is on the heavy side of the case capacity that drives it. And despite the velocity loss that is unavoidable in a short-barreled handgun, the company has a bullet in the Gold Dot that expands reliably, consistently and still penetrates while doing so. Let us not forget that expansion and penetration are not in and of themselves the best measures of a defensive bullet. You have to have correct bullet placement or the penetration and expansion are for naught. The accuracy of the Gold Dot bullets is plenty good enough for that. If you get your sights where they will do you the most good, you can count on the bullet doing the rest. For something to stuff your daily carry gun with, you'd be hard-pressed to find something better than this. For those of you packing compact .40s, you really should do yourself a favor and look into the Speer Short Barrel loads. While Speer lists only the 180-grain as a Short Barrel load, it offers three bullet weights in its standard .40 Gold Dot hollowpoint load: 155, 165 and 180 grains. However, those are not tuned for short barrels, and you may find them having a bit more muzzle blast. Get enough to test in your pistol, to make sure the load hits to the sights, groups well and feeds properly. Then stock up and carry safely, knowing you've got primo defensive ammo at your beck and call.